Dante Di Sione can't believe a beautiful blonde is blackmailing him with his family's stolen tiara! If Willow wants a date for a family wedding, she'll have to play the part fully. Only, Willow's confidence is fake…and she's a virgin! One stolen night with French billionaire Nathanial Giroud changed Princess Catalina's life forever! Having escaped to the Pyrenees, Catalina must protect her child from the anguish of a royal life. Even if she has to defy the man she so desperately craves! Aspiring actress Goldie Beckett smashes billionaire Gael's dating rules when she storms into his board meeting! After discovering her pregnancy, Gael won't let his son be illegitimate. Gael must get Goldie to agree to the role of a lifetime—his wife! Don Xavier Del Rio is determined to claim the inheritance given to his aunt's housekeeper, Rosie Clifton. So when Rosie surprises him with a marriage proposal, Xavier sees a way to get everything he wants…including Rosie in his bed! 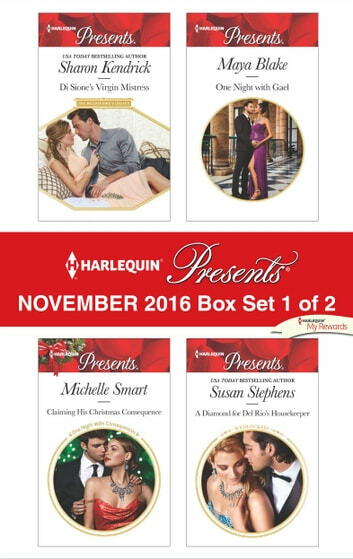 Be sure to collect Harlequin® Presents' November 2016 Box set 2of 2!